All major banks have cut their FD rates so that they are now below 7%. Banks which have not cut rates till now are expected to do so soon. FDs are perhaps the most popular investment avenue in India and any cut in rates is therefore bad news for savers. #1 Small Savings Schemes: such as Post Office Schemes and National Saving Certificate: This is for the most risk-averse investors. It is important to note that interest rates on these investments are now market-linked so they will also come down soon. However, the rate applicable for the Oct-Dec quarter was fixed in September when rates were still high. As a result, investors can still invest and lock-in the high rate till December. Update: Despite the fall in market interest rates, the Government has left the interest rates on various small savings schemes unchanged for the quarter of Jan-March 2017 extending the opportunity for retail investors to lock-in these higher rates. It is important to note that the rates offered on Post Office Schemes, Senior Citizen Savings Scheme and National Savings Certificate can be locked today for the entire tenure of these schemes. In the case of PPF and Sukanya Samriddhi Yojana will keep getting revised, so if you invest in these schemes you will only be able to get high rates for the current quarter. While investing do keep in mind that investments in these instruments are relatively illiquid as there are penalties for early withdrawal. #2 Liquid Funds: Many savers in India tend to stick to bank deposits dividing their saving between the saving account and FDs. Over the last 10 years (according to RBI data), savings accounts have returned c. 3.8% p.a. and FDs have returned c. 8.25% p.a. 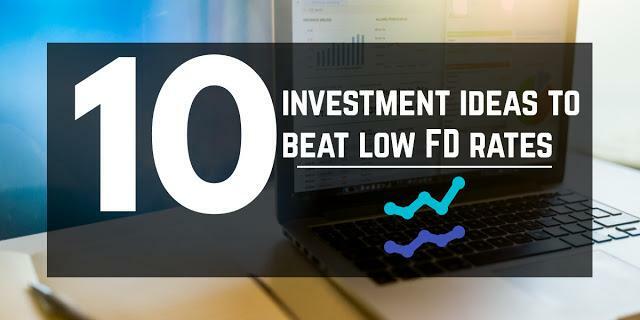 Now that FD rates have come down, investors can still maintain their returns by introducing Liquid funds into the mix. Liquid mutual funds are nearly liquid as your savings account but have returned 7.84% (category average, Morningstar) over the last 10 years – so 2x your savings account! As interest rates in the country have come down liquid funds will also return less than what they have in the past. As an estimate, in the last 10 years, Liquid funds have returned about 0.5% less than FDs. Now that FD rates are in 6.5-7% range, we should expect liquid funds to return around 6-6.5 %. However, 6-6.5% is still significantly more than the bank savings account interest rate. By shifting some of the money that you maintain in your savings account to liquid funds, you can ensure that your overall returns remain the same even if FD rates have come down – and this without compromising on liquidity. #3 Arbitrage funds: These are mutual funds which use equities and equity futures contracts to give returns which are extremely similar to liquid mutual funds. Over the last 10 years, the average arbitrage fund (category average, Morningstar) has returned 7.74% p.a. However the catch here is that because arbitrage funds are invested in equity instruments, they are taxed like equity mutual funds. This means that dividends are tax-free, short-term capital gains are taxed at 15% and long-term capital gains are applicable after 12 months and are 0. In contrast, FD and savings deposit interest is taxed added to the investor’s income and taxed at applicable income tax rate. Hence to do an apples-to-apples comparison, for somebody in the 30% tax bracket, if they hold an arbitrage fund for 12 months then a 7.74% return is like earning 11% on your bank deposit. Despite the significant advantages offered by arbitrage funds, many retail investors stay away from them because they don’t think they understand the strategy by which these funds earn debt-like returns. Yet now is a good time to learn about them because together with liquid funds, arbitrage funds can add a lot of value to your portfolio. However do note that like liquid funds, arbitrage fund returns will also be lower going forward – around 6 – 6.5% post-tax or 8.5-9% pre-tax. #4 Non-convertible Debentures/Corporate Fixed Deposits: When you make an FD, you are essentially lending money to your bank. With NCDs and Corporate FDs, you lend money to a company. Because lending to companies is considered to be more risky than banks, therefore such instruments pay higher interest rates than bank FDs of similar maturity. However, do not believe anybody who tells you that this increase in interest rates that you get is risk-free. At the end of the day, there is a very real default risk which exists with lending to companies and which does not exist with bank FDs. #5 Tax-free Government bonds: These are bonds that are issued by government-backed entities on which the interest is tax-free. Though the interest rates on these bonds are also slightly lower because of the tax-free status, typically for people in the 30% tax bracket the post-tax returns work out to be higher than FDs. Due to an economy-wide lowering of interest rates, yields on tax-free bonds have already come down, but they may still give slightly higher returns than FDs for those in the higher tax brackets. While investing in tax-free bonds, it is important to note that the liquidity in these bonds is quite low, so you should be prepared to hold them to maturity. Alternatively, investors can also consider long-term gilt funds (See #7). First is credit risk i.e. they can hold more risky debt instruments such as the NCDs we saw earlier. These instruments have a greater risk of default and hence they pay higher interest rates to compensate for that. Second is interest rate risk i.e. they hold instruments have a long time to maturity. Whenever interest rates come down (up), prices of bonds go up (down) but this effect is dependent on the average maturity of the debt. Debt funds which hold debt with a long time to maturity react more to interest rates and hence have more interest rate risk. So one idea for investors is to invest in short-term funds (hold debt instruments with 3-5 years to maturity) which take credit risk but where interest rate risk is relatively lower. These funds go by many names such as income funds/accrual funds/credit opportunities funds etc. They will give good returns ( and do better than FDs) as long as the underlying companies whose bonds they hold do ok and do not default. #7 Debt mutual funds – long-term: Following the discussion in point 6, the second type of debt funds that investors can hold is those that take significant interest rate risk but low credit risk. These are the Long-term gilt funds. They hold government bonds (so almost no risk of default) but with a long time to maturity like 7 to 10 years. These funds will do extremely well if interest rates come down. In fact post demonetization, as FD and other interest rates have come down these mutual funds have been top performers. As long as you expect interest rates to continue falling or at least not rise substantially, it can be a good idea to allocate a part of your portfolio to Long-term Gilt funds. #8 Equity Mutual Funds: Investors willing to take more risk can invest in equity mutual funds. Typically when interest rates come down, equity markets do well as both consumers and businesses are able to borrow on more favorable terms. First-time investors can look at large-cap diversified funds which invest in the biggest companies on the stock exchange and are hence considered to be the safest among equity funds. #9: A combination: One main takeaway from our discussion here is that if you want to earn returns above FDs than you will need to take more risk. You can either take credit risk or interest rate risk or equity risk. But why put all your eggs in one basket? You can do better by diversifying across these different kinds of investments. At ORO we have built portfolios using these different kinds of mutual funds which can give you 8-10% returns for the lowest amount of risk. Further, these portfolios are constructed using direct mutual funds so you do not pay any commissions and get to keep all of your returns. You can check out ORO portfolios here. #10: Our last investment idea is about what to avoid. A lot of investors may be tempted to buy debt-oriented balanced funds. These are mutual funds which invest in both debt and equity but mainly in debt. They are often marketed as a way to earn debt-like returns but with an equity kicker. However, it is rarely a good idea to buy such products because they give you debt fund-like returns with equity fund-like expense ratios (or expenses that a mutual fund charges). This unnecessarily brings down returns. Investors are usually much better off building their own portfolios buy buying equity and debt funds separately.